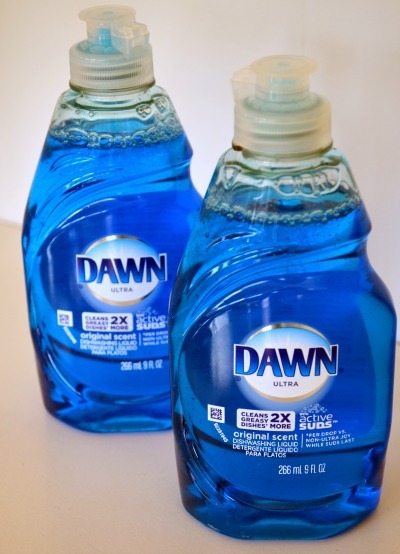 Did you know Dawn dishwashing liquid isn’t just for dishes? It cleans windows and soap scum, controls dog fleas, removes spots on laundry, and so much more. Edited to add: Be sure to scroll down through the comments. This has been a top post for many years and people have added more ways that they use Dawn. 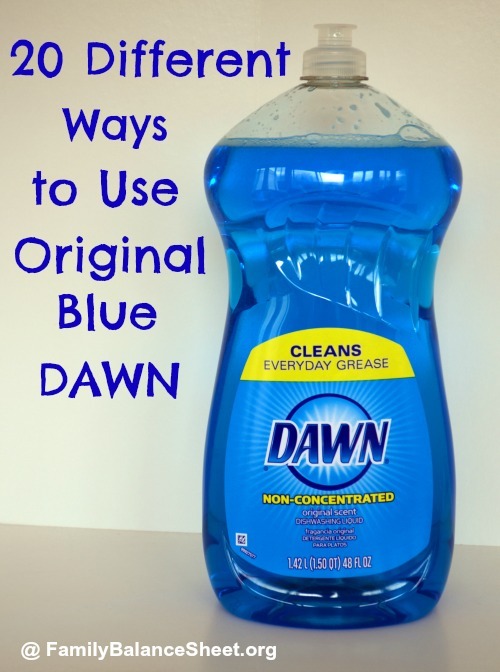 I’ve been using Original Dawn Blue for years to wash my dishes, but just discovered it is capable of so much more. It cleans our windows and mirrors (for just pennies), controls dog fleas, cleans soap scum in your bathroom, removes spots on your laundry, and makes amazing bubbles. And that’s just a few of its uses. And bonus, these new uses cost much less than the store bought version. Apparently, there is a difference in effectiveness between the non-concentrated Original Dawn Blue (in the picture above) and the Dawn Ultra (in the picture below)? I didn’t even realize there were two variations until I read the comments of one of these posts and a reader claimed that the non-concentrated version works better than the Ultra. Personally, I don’t know. Unknowingly, I’ve been buying the Ultra version and it’s worked just fine on my dishes and windows. I did search for the non-concentrated version and the only store that carried it was Walmart. It is much cheaper per ounce than the Ultra, 6 cents per fluid ounce vs. 11 cents per fluid ounce, but whether it is any better, I’ll have to test it out. Are you an Original Blue Dawn fan? What have you used it for? Let us know in the comments. Thanks so much for sharing these. I can already see a couple I’d like to try and one I’ll be passing on. Not sure if this was mentioned yet but like fleas I use it for lice. Literally suffercates the lice…. no harsh chemicals, hair will feel like straw until it’s dry and then it actually becomes the softest hair ever. Just let the dawn sit in the hair for about 5 mins. Heard it drys the nits out too…. and they won’t become amune to dawn. My grandmother swore by original blue Dawn for all of her cleaning needs… I don’t think she used anything else… My grandfather was the district fire chief of New Bedford, MA… She used to was his soot filled uniforms in Dawn, I remember her handwashing all her window treatments in the bathtub with Dawn as well… She always had the secrets for a meticulously clean home… 21 years since she passed, her secrets still work in my home. Wal-Mart & Home Depot carry the Dawn Simply Clean & Dawn Ultra is on the shelf at stores everywhere. I worked in an Emergency department and we used Dawn to removed tar from skin. Worked great! thanks for the tip, Sheri! Great tips, I didn’t know about quite a few of these. I use it on my dachshunds belly because it gets SO dirty that normal dog was won’t touch it! I’m a chef and every kitchen I’ve worked in has used Dawn to clean countertops and stove tops. Takes the grease and grime right off. It’s all I use at home too. Once I used it to get rid of a cockroach that dared enter my kitchen because I couldn’t find the insecticide. It worked better than the real thing. Later I tried with it diluted an worked perfectly too. I’m considering putting it in a spray bottle! I use Dawn ultra to wash my hair. I wouldn’t use it if I had colored hair except right before I would color it to remove all the residue. My head feels great, hair is clean and shiny. Rinse with white vinegar. Use as aphid killer on herb plants. I’m making up these measurements, so here goes. Fill a small spray bottle full of water. Then add 1 tablespoon to every 2 cups water. Shake to mix. The Dawn water clogs up their airways and the rain or tap water will wash the soap off of your herbs before you eat them. You can spray dirt in pots too. It removes all makeup build up on your makeup brushes. When you use it you will be surprised how much better they work, like when they are brand new. Original Dawn was discontinued and replaced with Dawn Ultra in the 1990s. The one you keep referring and have affiliate linked to as “Original” is actually Simply Clean which is a watered down version of Ultra. Thanks for pointing that out. I removed the links–they were old. I had mites on my lemon plant. I rinsed the plant off in the bathtub and then sprayed the whole plant down with dawn dish soap (non-concentrated) in a spray bottle with water. I added extra soap. Then let it dry on the leaves. Then every 2-3 days for about 2 wks, I would use a soapy washcloth and wipe down each leaf separately and the mites never came back! I have used Dawn for too many years to count. A small bottle and a toothbrush sit near the washing machine. I check my husband’s clothes (shirts especially) before washing as he has a tendency to get food on his shirts. Pre-treat all oily / greasy stains before laundering with Dawn and a toothbrush. It works almost every time. I check again before putting clothes into the dryer. Often, if they get put in the dryer the stain is set for good so I always check again before drying or I air dry. It’s the best for grease stains and anything ryour guy gets on his clothes when working on a car. Great tip, Michelle! Thanks for sharing. Every morning I use a few drops of Dawn to some water to soak the retainers I have to wear every night. Quick rinse in the evening and good as new. I use a few drops of dawn, mixed with vinegar and water in my Hoover Floormate to clean time and the kitchen floor. It gets all the dirt from the dogs and us off everything. I use the same mixture to clean the bathroom.